Since it was first published by the American Scouting Historical Society in 1996, the Blue Book Standard Order of the Arrow Insignia Catalog has become the defacto reference for collectors of Scout OA emblems. In 2000 the third edition of the Blue Book was published, and for the first time included event issues for each Lodge. 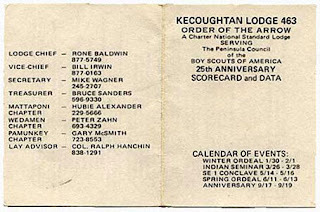 The event listings for Kecoughtan Lodge were provided by the late Dr. Ron Godby, who was the Blue Book regional editor for Virginia. Based upon the collection of items shared with his son, Jeff, Dr. Godby's list of 100 event emblems spanning Kecoughtan's existence from 1952-1995 has remained unchanged in the Blue Book for every edition since. There are three items in the Blue Book list of Kecoughtan event issues that I believe should not be included. One is the 1970 Fall Fellowship patch that was inadvertently released without the numerals corrected from "453" to "463." This will be a topic of a future article. Two other items are leather items that I contend were private issues that were never intended to be official Lodge issues. These are the 1976 Summer Ordeal leather round and the 1992 NOAC leather round with leather thong and beads. For both of these events official Lodge emblems exist (the 463 R2 was distributed at the 1976 Summer Ordeal and the 463 S32 flap was specifically designed for Kecoughtan's NOAC delegates). In over thirty years of collecting Kecoughtan emblems I've never seen one of these, nor had any other collector I queried about it. I should have gone to the source of the original listings many years ago instead of relentlessly hounding every Virginia OA collector I knew. Interestingly, this item does not appear on the list of Kecoughtan issues that was published in the December 1990 Scouting Collector's Quarterly authored by Ronald and Jeff Godby, so I suspect it was added to their collection at a later date. It was only recently that I decided to inquire about this emblem directly to Jeff Godby, and it was because Dr. Barry Green was certain that if it was listed on Dr. Godby's list there must be one in the collection the list was based upon. Jeff confirmed the existence of it and sent me the photograph you see above. Unfortunately, he was unable to provide any background details about it, so I continued my search for information about it's provenance. I am reasonably sure I made this because the acorn stamp looks like mine and the lettering looks like mine. If I did make it it was just a few to "swap." From what I remember of the leather emblem shown, I don't think that it was ever an official lodge issue. I was Treasurer at the time and I know that we never sold this item nor contracted to have it made. I want to say that I remember this being a project of one of the older men in the lodge (like Milt who used to make the Kecoughtan lodge name tags) and that he had been fooling around with a brand hence the leather emblem. I don't think they were given to everyone (maybe just those in his chapter Pamunkey - maybe) but It was a long time ago. I'm 90% sure I have one at home just as an oddity. I could be wrong but I was pretty heavily into patches then and I don't recall this being a lodge issue. I do remember seeing it though but it's origin was more of a craft work piece. I don't specifically remember this one but do remember that Duane McSmith was cranking these leather medallions out on an ad hoc basis (there are other designs floating around that you haven't run across yet, I'm sure). This looks like one of his - I'd bet on it. We did not have a '76 Spring Ordeal leather, for sure. Gary McSmith ran for Lodge chief with a leather McSmith patch, and we had the SE 1 Indian Seminar. Both of those issued leathers. The McSmith patch, which says McSmith on it, certainly is not a lodge issue. The Indian Seminar patch is just that. Otherwise, there was nothing else. Of that I am certain, since that was our 25th year, and I oversaw everything associated with that year. [It] certainly was a private issue that was not even known within the lodge. McSmith's dad made them, I think. As a result of these findings I will be relocating this item from the event emblem listings on my site to an Unofficial Emblems category alongside the beaded version of the A5 (also created by Duane McSmith). 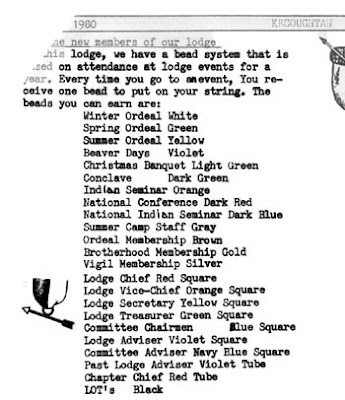 Unlike the Unauthorized Emblems like the ZS1 reproduction of the S10 Brotherhood flap and the ZC1 fake acorn-shaped chenille, the unofficial emblems category is designed to catalog items made by Lodge members that represented Kecoughtan Lodge but were never created as an official issue of the Lodge. Another example of such an issue is the painted plaques sold as fund-raisers with the Kecoughtan flap design. 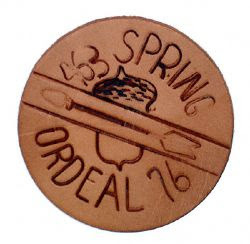 I will also petition the current Regional Editor of the Blue Book to remove the Spring 1976 Ordeal leather emblem from the Blue Book event listings beginning with the next edition. Many thanks to the Kecoughtan Arrowmen and collectors who helped me retrace history to discover the roots of this unique emblem. I'll bet Duane McSmith never anticipated it would earn so much interest 33 years after he created it in his workshop! Larry Johnson kindly sent me a couple of district patch images that I was missing for Colonial Virginia Council, including a silver bordered James River district patch to go along with the blue and yellow bordered varieties, and the above patch for Colonial Trail District that serves the City of Suffolk, Isle of Wight County and Surry County. I especially like the pig and peanut icons that are emblematic of major industries in those areas. You can find district emblems for Colonial Virginia Council included on the Colonial Virginia Council-Other Emblems page. 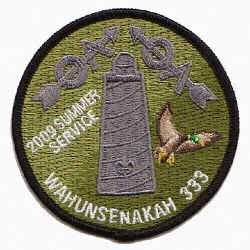 Wahunsenakah Lodge held their Summer Service event (formerly known as the Summer Ordeal) on August 21-23, 2009, and issued a 3" round pocket patch to commemorate the event. The design is not a surprise since all of the event patches this year share the same design with the only difference being the color of the background and the name of the event. Still on the schedule for event patches later in 2009 are the Fall Fellowship (presumably now called the Fall Service) on October 23-25 and the Holiday Banquet on December 5. I've avoided adding Council event emblems to the patch listings on this web site since to do so would expand the scope and number of items I keep track of exponentially. 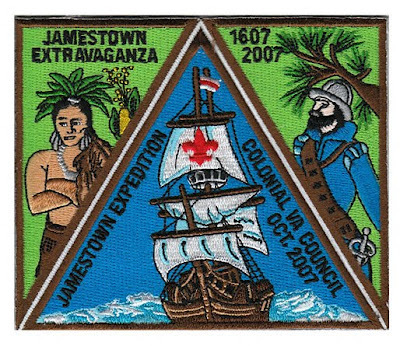 But I recently acquired a very attractive 3 part patch issued by Colonial Virginia Council for their 2007 Jamestown Extravaganza and decided I couldn't leave it off the site. After all it wasn't just a weekend event, it spanned 18 months and had to be earned by completing a series of requirements that taught the historical importance of Jamestown. If you aren't familiar with the Jamestown Extravaganza I encourage you to read the booklet issued by the council; you'll be impressed by the Council's efforts to commemorate this historical event with such a thorough Scout-related program and how nicely they integrated it with advancement opportunities. You'll find it listed on the Colonial Virginia Council-Other Emblems page. With the recent release of the two special 2009 NOAC flaps (S39 and S40) Wahunsenakah Lodge passed a pair of milestones. First of all, Wahunsenakah has issued more flaps in 13 years than Kecoughtan 463 did in its forty four years of existence (38 flaps for the Acorn lodge), or Chanco did in forty three years (11). The Lodge issued four flaps in 1998, 2002, and 2006. It's not a coincidence that all of those years included a NOAC which warranted trader and delegate flap issues. The acorn Lodge, on the other hand, did not change the design of it's flap patch from 1953 until 1976. Things have changed a bit, wouldn't you say? See Kecoughtan Kryer about 1980 for details. I dutifully filed the email in my "research when I have a chance" folder and as time passed forgot about it. Further hunting through earlier and later copies in the Kryer archive turned up just two references to the beads. The lodge will also try a experiment with a bead system based on attendance at lodge events for one year. A bead system is when you go to a event, you will receive one bead to put on whatever you wish to hang them on to show off how many beads you have earned. 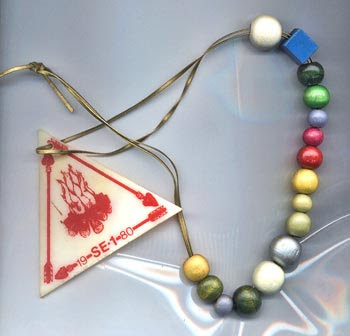 I didn't find any reference to the Bead Program in later editions, so I presume that it only lasted a couple of years (1979-1980), unlike the Honor Member patch award which began the same year and was issued each year through 1990. Now that you know how to distinguish the events related to each bead color, can you list all of the events and offices indicated on the picture of Tim's beads above? 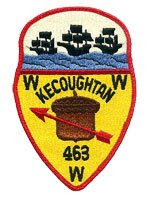 In July of 1971 Pamunkey Chapter of Kecoughtan Lodge 463 issued their first emblem, a 6" round, solid embroidered jacket patch. This multicolored patch with its Indian themed design has long been sought after and prized by OA collectors for its beauty and scarcity. 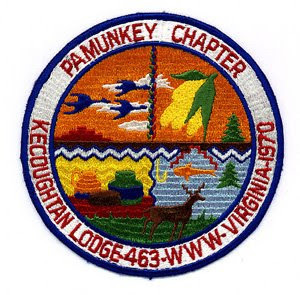 Even though I was a member of Pamunkey Chapter and have had this patch in my personal collection for over thirty years, it was only when I sought to learn more about it in July of 2009 that I discovered its fascinating history and the special significance of its design. Pamunkey Chapter was formed during the summer of 1970 when Peninsula Council, BSA reorganized its district geography. The Eastern and Central Districts, served by Allogagan and Pamlico Chapters respectively, combined to form Hampton District, and a corresponding chapter was created by Kecoughtan 463, the Councilʼs Order of the Arrow Lodge, to serve it. The new chapter was named for the Pamunkey Indians. Historians believe the Pamunkey were the most powerful of the tribes in the great Powhatan paramount chiefdom, which consisted of approximately 35 tribes with an estimated population of 10,000 led by of Chief Powhatan, father of Pocahontas. His territory encompassed the entire coastal plain from south of the James River to near Washington, DC. Powhatan was living among the Pamunkey when English colonists first arrived in Virginia in 1607. Today the Pamunkey Indians live on a reservation of 1,200 acres located on the Pamunkey River, adjacent to King William County, Virginia. Recognized since 1677 as a sovereign nation, the Pamunkey continue to hunt, fish, and make pottery on their ancestral land. Future plans for our chapter include the endorsement of the plan to build the dining hall at Camp Chickahominy, to get our own chapter patch, and to have a chapter camporee at the Pamunkey reservation near West Point. Soon after the chapter was formed its Advisor, Dr. Ron Godby, approached Tecumseh Deerfoot Cook, Chief of the Pamunkey Indians, and sought permission to use their tribal seal in a design he envisioned for a chapter patch. 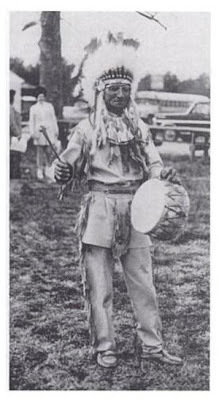 Born in 1899, Cook served as Chief of the Pamunkey for over 40 years, and lived to age 103. According to Andy Hess, who was treasurer of the chapter at the time, "the Tribal Council had a meeting and voted to allow us to use their seal." Photo by Helen C. Rountree, November, 1969. From Pocahontas's People - The Powhatan Indians of Virginia Through Four Centuries. Photo used with permission. There never was a set color pattern (from the Pamunkey Indians) when we got permission from them to use their seal for our patch. When I was Chapter Chief, we had several Chapter Executive Committee meetings where we all practiced coloring copies of the seal to get the final result. By the way, this was done at Dr. Godbyʼs dental office. We were looking for a lot of different colors to make it pleasing to the eye! The center of the patch is from their seal. They had no color scheme on their seal. The outside of their seal had their Tribe information where we put our lodge info. To the layman the Pamunkey Chapter J1 appears to be a round patch segmented into quarters, with an assortment of familiar Indian symbols representing various things found in nature, along with colorful pottery. However, after reviewing the Pamunkeyʼs explanation of their tribal seal, the symbols in the design take on new meaning. For example, the zigzag horizontal line across the center represents the Pamunkey River, which they describe as "the lifeblood of the Pamunkey people ... the center of our very existence." The beautiful new Chapter patch is now available to Chapter members at $3.50 each. Ordeal members are allowed to buy one, whereas Brotherhood members may buy another, and Vigil Honor members a third. The 5 elected Lodge officers and their advisors may buy one each. Chief Mike Kinzie reports that Chapter backpatches have been received and will be on sale at the Spring Ordeal and possibly at the Pamunkey Fellowship on April 19-21. The Pamunkey Chapter J1 patch is now cataloged as having two varieties: J1a with a BRN (brown) deer, and J1b with a DBR (dark brown) deer. Bill Topkis, Editor in Chief of the Blue Book Sixth Edition, graciously provided a comparative photograph of the patches that were used to document this variation. As you can see below, the J1a with the brown deer is on the right, the J1b with the darker brown deer on the left. The same difference in the shade of brown is also evident in the horizontal line representing earth in the center of the patch. There was no intended design difference. There seems to be just minor variations in the brown color. I don’t think it is significant enough to warrant an inclusion of the second patch in the Blue Book to make it another “collectors item”. It sure was not intended to be another different collectible patch. We never noticed a difference when we compared the different orders when the second batch arrived. My patch that I have is the one on the left with the brighter brown thread. There are always minor color differences in threads between different loom runs. There are two slight color variations on the Pamunkey deer - Andy Hess ordered the patches twice. They are so slight in my view as not to warrant a and b designations, but that is entirely subjective. 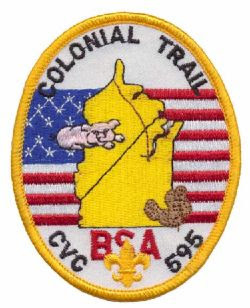 In 1985 the Chapter ordered a slightly revised version of the patch with a rolled (instead of cut) edge and computer designed pattern with sharper details. 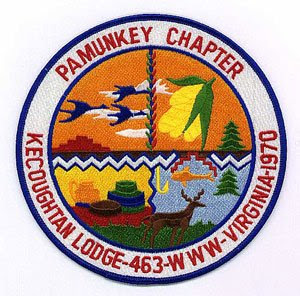 This patch is listed in the Blue Book as the Pamunkey Chapter J2. The same design was used for the first jacket patch issued by Pamunkey Chapter of Wahunsenakah Lodge 333, the Lodge formed by the merger of Kecoughtan 463 and Chanco 483 in 1996. Wahunsenakah is the Algonquin name for Chief Powhatan. The name and number were changed to reflect the new Lodge identity. Blue Book lists it under Lodge 333 as Pamunkey J1. A 3” round pocket patch with the identical design was also issued, listed as Pamunkey R1. I hope this article has given you a new appreciation for these emblems of Pamunkey Chapter inspired by and honoring the Pamunkey Indian Tribe, and that like me you are motivated to learn more about their history and culture. See the bibliography for some excellent resources. Larry Johnson of Wahunsenekah attended the 2009 National Order of the Arrow Conference at Indiana University, and upon his return kindly sent me pictures of the flaps that the delegates from Lodge 333 traded this year. Larry reports that 150 of the silver bordered delegate sets and 850 of the red bordered trader sets were issued. 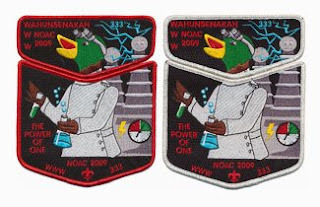 The patch was designed by Lodge member Casey Johnson and cleverly interprets the theme for this year's NOAC, The Power of One. You can find pictures of these and every Wahunsenakah Lodge flap on the Wahunsenakah Lodge Emblems page. The 463 A-6 arrowhead is a diminutive, simple patch whose complex historical background belies its plain appearance. Just 3 inches tall and 2 1/8 inches across it's widest part, the patch has a gray twill background and just two thread colors: red border, lettering, and arrow, and an outlined dark brown acorn. The gray background of the flap denotes its significance to the Lodge. This small arrowhead was issued in 1976 on the occasion of Kecoughtan's 25th (silver) anniversary. The design mirrors the first arrowhead patch that was issued by Lodge 463 in 1952 that had a green twill background, red border, lettering, and arrow, and a fully embroidered brown acorn. The patch was designed not only to commemorate the 25th anniversary of the Lodge, but as a limited edition reproduction of the original Lodge arrowhead it had to be earned. "In this issue you will find information on the Lodge 25th Anniversary Award, available to all members who meet the requirements on page 3. The award itself will be a reproduction of the first lodge emblem, the arrowhead, with a silver background." "It should be possible for every active Arrowman to fulfill the requirements …"
"The requirements to receive the award were not trivial. They included service work far beyond the level that the casual lodge member wanted to devote. The service work requirement was intended to get the lodge membership involved in the considerable amount of work needed to prepare for the celebration." "I again emphasize to all of you the dire necessity that you attend the lodge events. The lack of strong participation is hurting the effectiveness of our Brotherhood greatly. I would like to ask that you go forth to your fellow Brothers and promote greater Lodge spirit and participation for this, our 25th year. And that is about as blunt as I can state it." "How are you doing on your 25th Anniversary Award? The requirements are tough, and we know that anyone who earns the award will have shown a heck of a lot of dedication to the Order and to Scouting. Show us your dedication: be one of the few to leave the 25th Anniversary celebration with an award on your pocket!" 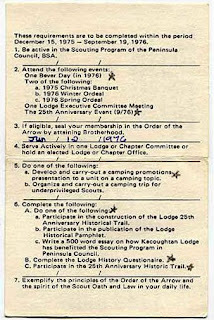 The Kecoughtan Lodge history booklet issued for the Lodge's 40th Anniversary in 1992 recalls the 25th anniversary event held Sept. 16-19, 1976 as a huge success, noting that 261 Brothers attended, including Dr. E. Urner Goodman, founder of the Order of the Arrow. The booklet also noted that "16 Brothers received the Lodge's 25th Anniversary Award." There were far more of the silver arrowhead ordered (500 by one estimate) than Arrowmen who earned them, so the Lodge Executive Committee was faced with the difficult decision of what to do with the remainder. "At that point it seemed like the best course of action to just go ahead and sell them and at least recoup our costs. At that point, the patches didn't mean much anymore, but were still a nice reproduction of the original arrowhead patch of the lodge. In retrospect, a reproduction patch probably shouldn't have been chosen as the award patch - too many people wanted one but didn't want to do the work associated with the award. That patch caused some hard feelings around the lodge that took awhile to go away." 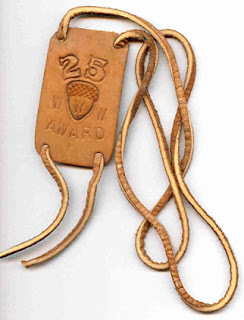 There were only a couple dozen folks to complete the requirements for the 25th anniversary award and the patch (gray arrowhead) intended for this award was in fact released for sale in the trading post because there were too many that would be left over. This proved to be politically contentious in the Lodge Executive Committee and there were some bruised feelings about it … It seems trivial now but at the time it was a big deal to some. From this we learned not to treat any patch award as truly restricted. To properly award the Arrowmen who had completed the difficult requirements to earn the Award the Lodge Executive Committee approved a special handmade leather emblem designed by Duane McSmith. The one pictured below belongs to George Bains, who was Chairman of the 25th Anniversary Celebration Committee. "I don't know if I ever received the leather patch made by Mr. McSmith - I looked through my memorabilia and couldn't find it, but I did find this one gray arrowhead - I guess it really does mean something to me after all these years - I wouldn't part with it for any amount of money. Thanks for reminding me of a wonderful time in my life - there are a lot of memories in this old patch." While the rest of the trading and collecting nation is living it up at NOAC 2009 in Bloomington, IN I decided to distract myself with some site maintenance. I've been meaning to add thumbnail images of patches to the catalog listing pages for years now, but have always put it off until the site is generated dynamically from a database instead of static pages. That's proven to be more of an obstacle than I originally expected, so for the time being I've manually implemented thumbnails on several pages to see how they look. The original page converted to thumbnail view was the Wahunsenakah Lodge flaps page and I've been pleased with the results, mostly because of the elegant way that the highslide zooming effect allows you compare multiple images (ie, NOAC delegate and trader issues from a particular year). I used the same size for the Colonial Virginia Council CSP, FOS, and JSP pages. Based upon the dimensions of those thumbnail images I elected to go with 150 pixels wide as my default for the Kecoughtan Arrowhead and Round shaped emblem pages. I am still on the fence about the final results. 150 pixels wide looks fine for flaps and CSP's but when the height of the image is the same or more the thumbnail images begin to overwhelm the page. Since the Kecoughtan Arrowhead and Round emblems pages don't have many items to list I'm not dissatisfied enough with the results to start over, but I don't think I can follow the same design for the Activity emblems page that has 100 different patches listed.